Personification is a lovely literary tool. It attributes human-like qualities to things that are non-human (such as animals and pets) or inanimate (such as notebooks or stones). Suddenly, a silver stream is winking at you and a tea kettle is whistling your favorite tune. In poetry, personification is particularly enjoyable because it "brings objects to life." This allows readers to feel as though they're standing within the pages. Not only is personification eye-catching, it can also be quite funny. Together, let's explore humorous examples of personification in poetry. In children's poetry, personification helps writers capture readers' imaginations. It's likely they'll giggle at the vision of a dancing tree and remember the writer's prose. 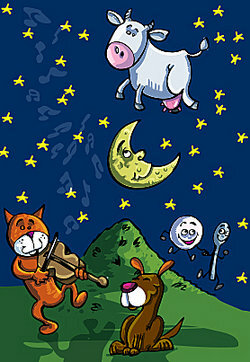 Nursery rhymes, in particular, are filled with rhythmic stanzas that embody personification. Let's start with a classic, "Hey Diddle Diddle" by Mother Goose. Here, we enjoy silly imagery, such as a dog laughing and a dish running away with a spoon. While this may be a simple nursery rhyme, without tremendous depth or meaning, it's a great example of personification's ability to charm a smile out of us. I wait for the time, I wait for the chance! tables and chairs become their ballroom! I flick my fingers; swing my wrist. Beans and turkey are doing the twist! on to the walls, they're doing the tango! Adults should also be able to let out a smile or two at the prospect of personification. The same purpose prevails: it makes the verse stand out in their minds and last forever. Even though there are seven common types of poetry, it's not far-fetched to imagine personification popping into each category. That was fun, right? Personification must've had a prominent place in Sharon Hendricks' heart. She not only personified food, but also nature. In "My Town," we watch her bring leaves, a brook, and a fence post to life. When's the last time you saw a fence post gossip with its neighbor? The traffic lights yelled, "Stop, slow, go!" And hide in your hair. And whisper in your ear, "I love you." That was fun, right? How many smiles did you crack? Personification is a member of the literary device family tree, but it's also a citizen of the land of figurative language. Figurative language compares two things in an unusual and interesting way. It lends itself beautifully to poetry because it paints such a vivid mental picture. While you're creating fanciful visions in your mind, enjoy these Examples of Imagery Poems. In the end, personification can change the way you perceive a poem and even change the meaning of a poem. If you're planning to teach this topic to your students, perhaps they'll enjoy these Examples of Personification for Kids. Happy learning! "Humorous Examples of Personification in Poetry." YourDictionary, n.d. Web. 18 April 2019. <https://examples.yourdictionary.com/humorous-examples-of-personification-in-poetry.html>. Personification is a lovely literary tool. It attributes human-like qualities to things that are non-human (such as animals and pets) or inanimate (such as notebooks or stones). Suddenly, a silver stream is winking at you and a tea kettle is whistling your favorite tune. In poetry, personification is particularly enjoyable because it “brings objects to life.” This allows readers to feel as though they’re standing within the pages. Not only is personification eye-catching, it can also be quite funny. Together, let’s explore humorous examples of personification in poetry.